This was the original site of W.W. Sylvester’s home. Sylvester was an early station agent, insurance agent, and founder of the Issaquah Bank. 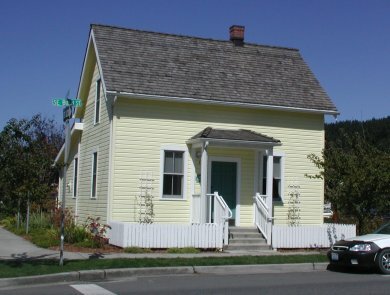 A reconstruction of his home is now used by the City of Issaquah. The “Trails House” is owned by the City of Issaquah and used primarily as a meeting place and headquarters for the Issaquah Alps Trails Club. The single cozy meeting room is used for committee and board meetings for various organizations and the City. The lean-to section in the back contains public restrooms (now closed to the public due to vandalism). The Issaquah Alps Trails Club was founded in 1970 by Harvey Manning to preserve open space on Cougar, Squak, Tiger, Taylor, and Rattlesnake Mountains, and Grand Ridge. This organization has been extremely effective, and is primarily responsible for the creation of a trail network and preservation of large wooded areas in the hills surrounding Issaquah. Members of the Trails Club initiated the Mountains to Sound Greenway movement in 1980. This home was once the property of prominent early citizen Wilbur W. Sylvester. He was the third station agent at the Gilman (later Issaquah) Train Depot from 1895 to 1899. When he resigned as agent to found the Issaquah State Bank, Sylvester stated, “I am going to try and increase the business by building up the town.” In 1912 he ran for Representative of the 41st District, pointing out to voters that he was the only candidate who lived outside of Seattle and was uniquely qualified to represent interests of the County. When the city decided restore this home to be used for civic purposes, the building’s condition was so deteriorated that the best option was to totally rebuild it from scratch.